Managing SSL roadwarriors entails managing group access to SSL VPNs and managing custom scripts for SSL VPNs. See the sections that follow for more information. Tip: Within a Microsoft Windows environment, to ensure that a user gets full VPN connectivity, add the user to the built-in network configuration operator group.  An installed default local certificate, see Setting the Default Local Certificate for more information. 1. Go to Network > VPN > Global. 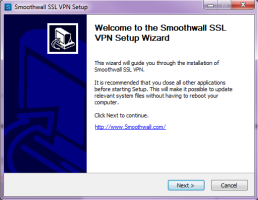 • Enable SSL VPN — Select to enable SSL VPN on the Smoothwall. Select to run the SSL VPN connection over TCP on port 443, the standard HTTPS port. This protocol is preferred for compatibility with filters between the client and the server. Select to run the SSL VPN connection over UDP on port 1194. This protocol is preferred for performance. • SSL VPN network address — Accept the default network address or enter a new one. SSL VPN users, when they connect, get an IP address on a virtual interface, within the Smoothwall. The IP range must not be one not used for any physical network. If the default subnet, 10.110.0/24, is taken by any existing network, configure this setting to use range not taken on the network. Note that because connected clients are placed on a virtual network, all machines they access must also have a route to this network. • SSL VPN netmask — Accept the default network netmask or enter a new one. • Force clients to use SSL VPN as gateway — Select to configure the Smoothwall to force the client to send all its traffic through the SSL VPN connection. The Smoothwall can force all connected clients to route through it, which is generally better as it enforces the policy on the server end. • SSL VPN client gateway(s) — Specify the hostnames, or IP address that clients connect to. Leaving this parameter blank creates an archive containing all IP addresses of the external connections that are active at the time the archive is generated. • Enable TLS authentication — Select this setting to apply Transport Layer Security (TLS) authentication. TLS authentication can mitigate in a denial of service condition. Note that for systems which have never had VPN configured, this setting is on by default. For systems which have had VPN configured, this setting is off by default. • Choose random gateway — Select this setting to enable clients to connect on a random address when multiple gateways are defined. This is good for load balancing over multiple links. 3. Click Save to save the settings. 4. Click Restart to apply the settings. 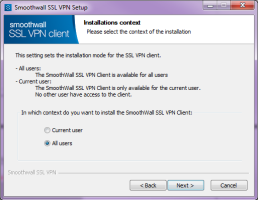 The Smoothwall’s SSL VPN functionality can be deployed to secure internal wireless interfaces. 1. On the Network > VPN > Global page, configure the SSL VPN settings, see Configuring the VPN Tunnel with SSL. 2. Click Advanced and, in the Additional SSL VPN client internal interfaces panel, select the interface on which to deploy the SSL VPN. 3. Click Generate client archive. 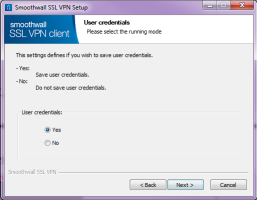 The Smoothwall generates an archive containing the client software and the VPN settings required and prompts you to save the file in a suitable location. Note: The same archive can be used for both internal and external use. See Configuring the VPN Tunnel with SSL for more information about external use. 4. Once saved, distribute the archive to users who require secure access to the internal wireless interface. You can use the Smoothwall’s portal to distribute the archive. For more information, see Making the SSL VPN Client Archive Available. You can generate an archive of the SSL VPN settings which can be distributed to users. Archives can contain SSL VPN settings and, optionally, custom client scripts. 1. On the Network > VPN > Global page, configure the SSL VPN settings. For information about how, see Configuring the VPN Tunnel with SSL. 2. If you do not want to include custom scripts in the archive, you can generate the archive now. 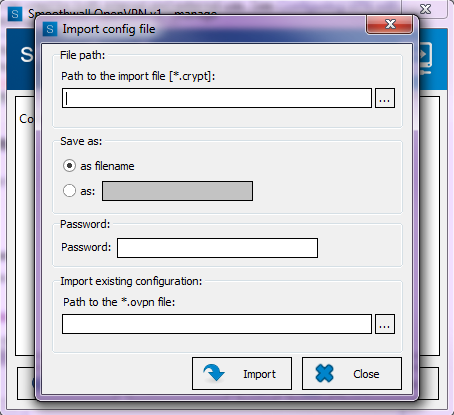 Click Generate client archive, the Smoothwall generates an archive containing the client software and the VPN settings required. When the Smoothwall prompts you, save the file in a suitable location. Distribute the archive to users who require secure access to the internal wireless interface. You can use the Smoothwall’s portal to distribute the archive. For more information, see Making the SSL VPN Client Archive Available. 3. If you want to include scripts in the archive, go to the Network > VPN > SSL roadwarriors page and configure the scripts. For information about how, see Managing Custom Client Scripts for SSL VPNs. 4. Click Generate client archive, the Smoothwall generates an archive containing the client software and the VPN settings required. When the Smoothwall prompts you, save the file in a suitable location. 5. Once saved, distribute the archive to those users who are using SSL VPN-ing. You can use the Smoothwall portal to distribute the archive. For more information, see Making the SSL VPN Client Archive Available. The generated client archive contains the SmoothwallSSL VPN client. For a detailed description of how to install the software, see Configuring and Connecting Clients. Note that the client software is for Microsoft Windows environments only. For more information about using the client software in other environment, refer to your Smoothwall representative. Note: An archive can be used for both internal and external use. See Configuring SSL VPN on Internal Networks for more information about internal use. By default all groups are allowed to use SSL VPN. 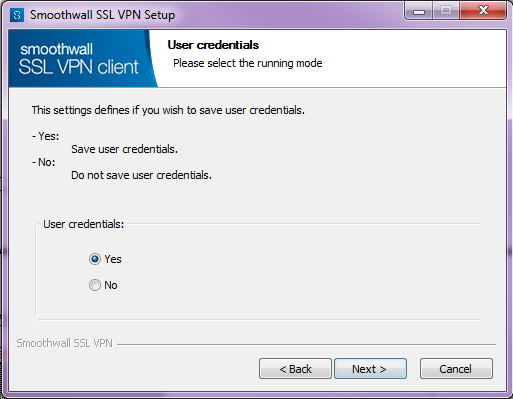 The Smoothwall enables you to stop one or more groups from using SSL VPNs by disabling access. 1. Go to the Network > VPN > SSL roadwarriors page. 2. From the Select group drop-down list, select the group you want to disable from using SSL VPN and then click Select. 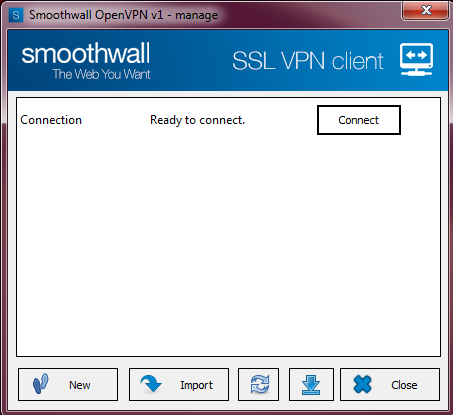 The Smoothwall displays SSL VPN group settings. 3. Clear the selection for the Enable option and click Save. The Smoothwall disables access. 4. Repeat the steps above for any other groups you want to disable from using SSL VPN. Note: The following instructions are for Microsoft Windows environments only. For more information about using the client software in other environments, refer to your Smoothwall representative. 1. Extract the client archive created in Configuring the VPN Tunnel with SSL to a suitable location. 2. It is recommended you have closed all applications on your machine before starting the installation. 3. 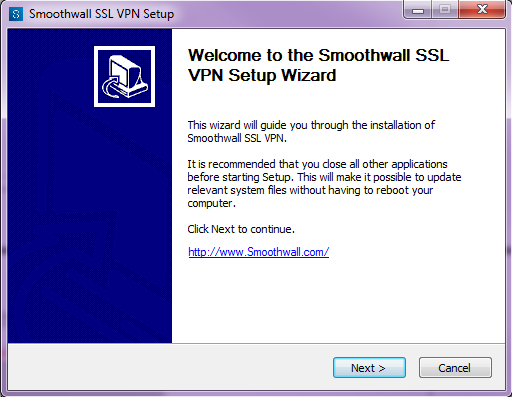 Double-click on SmoothWall-SSL-OpenVPN-client.exe to start the installation wizard. 4. 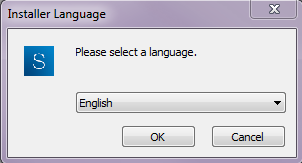 When prompted, select the installation language to use. 5. Click Next at the Welcome screen to start the installation. 6. Choose whether the SSL VPN client is accessible by All users of the machine, or by the Current user only. Click Next. 7. Choose whether the user must re-enter their username and password every time they open the VPN. Click Next. 8. Either accept the default installation folder, or click Go to select a new one. Click Next. 9. 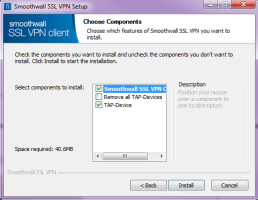 Ensure Smoothwall SSL VPN Client and TAP-Device are selected. Click Install. 10. When prompted, install the TAP-Win32 Provider V9 Network adapters. These are needed by the SSL VPN client. 11. When prompted, click Finish to complete the installation. 12. Create a shortcut in the Start menu’s Startup folder to ensure the SSL VPN client is available every time the user logs into their machine. Included in the archive downloaded in Configuring the VPN Tunnel with SSL are the connection details for the Smoothwall — Connection.ovpn. 1. 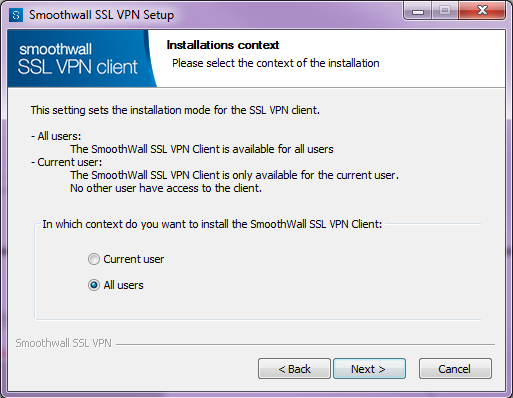 If the Smoothwall SSL VPN Client is not available in your system tray, start it from the Start menu. 2. Right-click on the Smoothwall SSL VPN Client tray icon , and select Show profiles. 4. From the Import existing configuration panel, click ... and go to the location of Connection.ovpn. This should be the same directory as where you extracted the Smoothwall SSL VPN client archive to. A new entry is made, labelled Connection. To rename the connection entry, you must rename Connection.ovpn before importing. 1. Right-click on the Smoothwall SSL VPN Client tray icon , and select Show profiles. 2. Click Connect next to Connection, or the renamed Connection profile. 3. Enter the user credentials when prompted, and click OK to open the connection. 2. Click Disconnect next to Connection, or the renamed Connection profile. The Smoothwall enables you to upload or remove preconnect, connect and disconnect scripts which can carry out custom commands before or after a VPN comes up or goes down. You can also deploy scripts based on groups. 2. 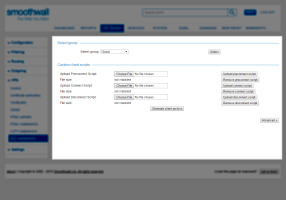 In the Select group area, accept the default settings to apply any uploaded scripts to all groups, or, from the Select group drop-down list, select the group to which the script(s) is specifically deployed. Click Select. 3. To upload a preconnect script, in the Custom client scripts area beside the Upload Preconnect Script text box, click Browse. 4. When prompted, go to and select the script. Click Upload preconnect script. The Smoothwall uploads the script, displays the size of the script and a message confirming a successful upload. 5. Repeat the steps above to upload connect and disconnect scripts as required. 2. In the Select group area, accept the default settings to remove any uploaded scripts from all groups, or, from the Select group drop-down list, select the group from which the script(s) is specifically removed. Click Select. 3. To remove a preconnect script, in the Custom client scripts area beside the Upload Preconnect Script text box, click Remove preconnect script. 4. The Smoothwall removes the script and displays a message confirming a successful removal. 5. Repeat the steps above to remove connect and disconnect scripts as required.